I hear the sounds of a military march in my mind every time I see my son in uniform. I have been proud of my son from the day he was born, but I experience a different kind of pride now. I thought that I understood what serving your country and freedom meant … and then my son became a soldier and went to France. In 2015, my son, Hunter Taylor, was sent from Fort Campbell, Kentucky to Normandy, France to represent the 101st Airborne Division, at the annual D-Day commemoration ceremonies. As a proud mother, I decided I had to go there myself to support him and share his experience. Like others, I knew the D-Day story from school books, and movies. However, after my experience in Normandy, I realized that I knew only the facts. Nearly seventy-five years after June 6, 1944, the French still honor D-Day in a different, more personal way than I think many Americans do. Perhaps it is understandable. While D-Day was “over there” for Americans, it was “there” for the French in Normandy. It was in their villages and homes, and on their streets and fields. It was—and still is—real to them in a way I could never have understood before my visit. I was fascinated by the way the French honored the veterans and the soldiers of their modern-day units. Celebrations and memorial services, were held side-by-side. One minute, I was watching a parade, fireworks, or a sky full of parachutes falling on fields. Moments later I was listening to a speech about the sacrifices that had been made or taking a tour of scarred buildings and vast cemeteries. I watched French citizens ask soldiers from the 101st Airborne Division to take photos, sign autographs, hold babies, and more. Both groups thanked and touched each other through these interactions. Watching these genuine expressions of gratitude filled my heart with love for my country and for my son, the soldier. It was an eye-opening experience for Hunter, his fellow soldiers, and me. We put our fingers in bullet-holed and blast-scarred walls, walked amongst bloodstained pews in a local church and learned truths about World War II that none of us had ever known. It moved me profoundly. It changed me. On my first day in Normandy, we met Dany Patrix-Boucherie, who enriched our visit with personal memories and experiences. Dany was born in the tiny village of Ste. Marie du Mont on the road between what would become known as Utah Beach and the prime Allied objective of Cherbourg. Dany’s first memories are of the German occupation and the hardships her family faced during that time. She vividly remembers falling asleep to the sound of German boots one night and waking the next morning to different sounds …the sounds of the D-Day invasion and the liberation it promised. 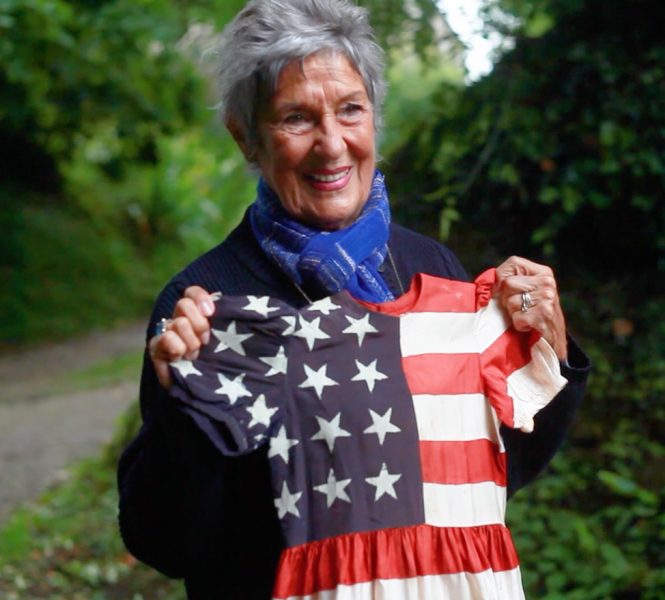 To celebrate the first commemoration of the Allied troops’ liberation of Normandy, Dany’s mother Cecile, crafted six-year-old Dany a dress out of American GI parachutes that were scattered in the streets of her town. Cecile designed the dress to emulate the stars and stripes of the American flag. Many historic photographs of the liberation ceremonies show Dany wearing this dress, a symbol of newfound freedom for Normandy. Today, seventy-nine-year-old Dany still has the same heart-melting smile and the dress she wore as a child. She took care of us in Normandy, making sure we went to events and immersing us in her history. For me, Dany embodied the French spirit of love and gratitude toward Americans that I felt from everyone during my time there. Upon returning to the U.S., I vowed to start a project to tell Dany’s story and the story of D-Day from the French perspective. Dany has since introduced me to many French citizens who survived the occupation and shared their stories and memories of the Allied liberation. I believe that these stories, along with those of American veterans, who played a vital role in the liberation, need to be heard by all Americans. As we lose more eye-witnesses every year, it is imperative that we document and share these harrowing and emotional stories, like the French do, before they, and the lessons they hold, are lost forever. Our project has already accomplished great things. 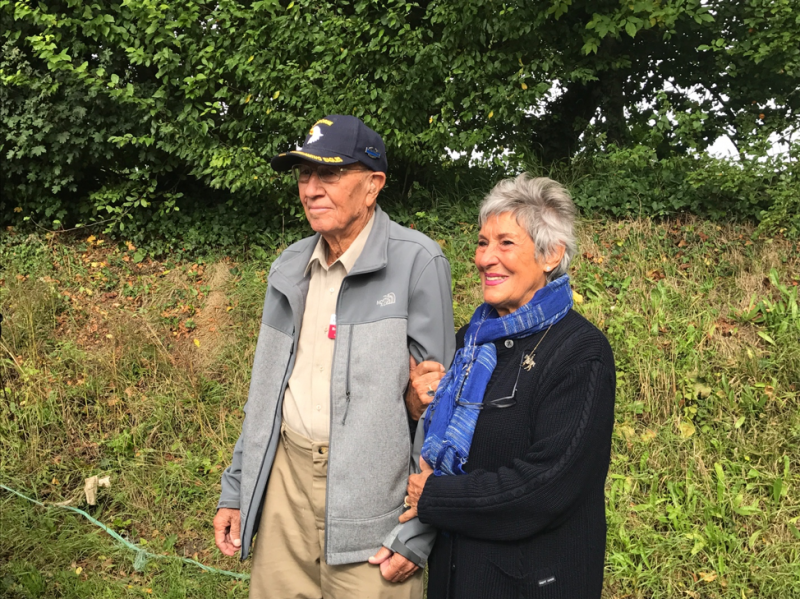 American Easy Co. veteran Brad Freeman, on his first trip back to Normandy since he jumped into Normandy on D-Day in 1944, was introduced to Dany, who he personally helped liberate in Ste. Marie du Mont. The moment Dany threw her arms around him was unforgettable and brought our project team to tears. In Carentan, we discovered a secret American radio signalman’s nest high in a remote corner of a farmhouse attic. Prior to D-Day, Sgt. 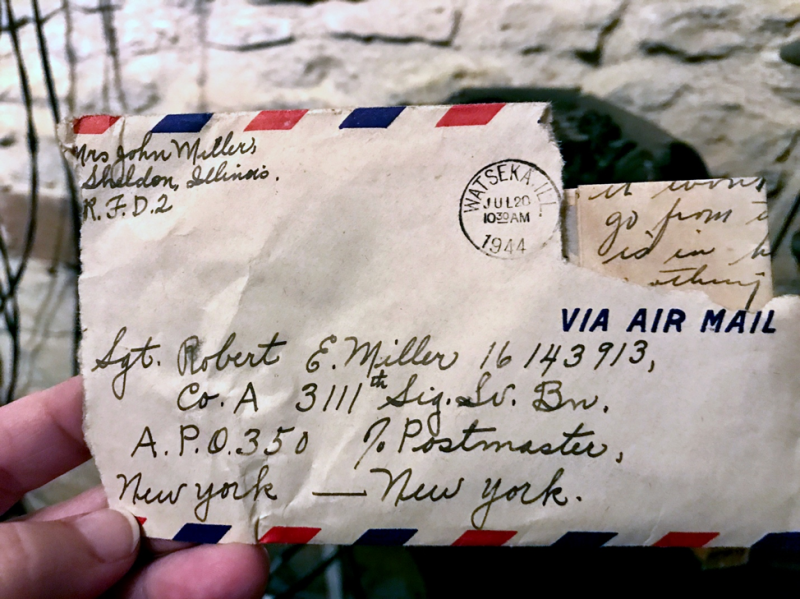 Robert Miller of the US Army Signal Corps infiltrated occupied Normandy and took up station in the attic with his radio to observe the Germans and report on their activities in advance of the invasion. More than seventy years later, Jean-Marie Calliard and his son, Gregoire, found bundles of letters in the floorboards of his observation post. Letters written to Sgt. Miller by his family and friends from the United States. With the help of Mr. Randall Underhill, Executive Secretary of the 101st Airborne Division Association and Breein Suver, County Deputy Clerk of Watseka, IL we found Sgt. Miller’s family and reconnected his daughter, Janine Perry, with the hidden letters. This film, The Girl Who Wore Freedom, will screen in Normandy next summer in conjunction with the 75th anniversary of D-Day at the Utah Beach Museum, The D-Day Experience and the Carentan Theater, May 31, Jun 4 and June 5th, respectively. As an independent female filmmaker, I started this documentary on my own. I’ve invested my own money to bring these stories to life. 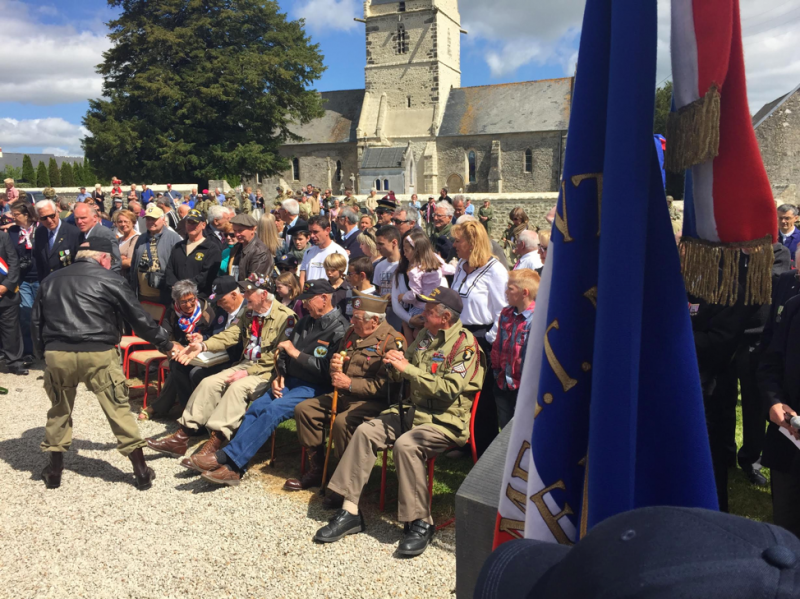 This past summer I brought a production crew to Normandy to record interviews with French survivors of the occupation and WWII Veterans and to film celebrations, memorial services and parades. Currently, I am raising funds in order to finish the film and we need twenty-five thousand dollars to complete the film in time for the 75th anniversary of D-Day. All donations are tax- deductible. I am seeking donations from individuals, corporations, foundations, and organizations who are passionate about honoring those who served in WWII and preserving their eye-witness accounts. Our current crowdfunding campaign is taking place with the help of our non-profit 501(c)(3) fiscal sponsor, IFP Chicago. If you’d like to donate and share stories of friends or family who fought in France during WWII please visit our website: www.normandystories.com or email me, Christian Taylor: christian@normandystories.com. You can follow the making of our documentary through our social media platforms below. We also are telling great stories from WWII soldiers and their families on our blog found on the news section of our website and you can follow the behind-the-scenes story of The Girl Who Wore Freedom on our podcast, Documentary First: A First-Time Filmmaker’s Journey.